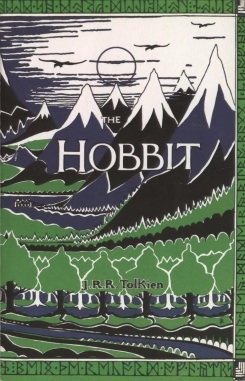 The Hobbit was J. R. R. Tolkien's fantasy novel before his three-part masterpiece, 'The Lord of the Rings' was published. At the time of writing this novel, the idea of writing 'The Lord of the Rings' had not crossed Tolkien's mind. Hence it was supposed to be a one part novel, but the success of 'The Hobbit' inspired Tolkien to write its sequel, 'The Lord of the Rings.' 'The Lord of the Rings' was also inspired by World War 2 in author's own admission as it was written during the same period. The success of The Hobbit and its sequel, The Lord of the Rings, popularized the fantasy genre and later on many masterpieces like Star Wars and A Song of Ice and Fire were written and they became equally popular on their own and created a dedicated fan following of their own. Even today, on social networking sites, many fans fight for their favorite, saying one or the other is better. I read this novel after I watched the movie which was part of a three-movie series directed by Peter Jackson who also directed the successful Lord of the Rings trilogy. I felt that movie series was little over-stretched by making it into a three-movie series. Making The Lord of the Rings into a trilogy was justified because the novels were also released in three parts and story was longish in nature. A thought that comes when I talk of a movie adaptation of a novel is that which one should we do earlier - watch the movie or read the novel. One thing can be said that watching a movie before reading that novel limits the imagination. What you read in a novel in 3-4 pages can be shown simply by a picture and whatever mental sketch you draw while reading a book need not be drawn while watching a movie. Everything is present in front of you. This is my opinion. You may have a preference of movies over books because of a shortage of time or lack of interest in reading. While talking about movies of this trilogy, one must appreciate the beautiful landscapes of New Zealand, which were diverse, attractive and looked untouched. The story of the Hobbit is a quest by the dwarves to regain their ancestral homeland. In this quest, they are helped by a wizard and a hobbit. This concept of a quest is applied to almost all novels of the fantasy genre. You can see that in Star Wars where Jedi knights wait for the promised one to take on the Sith Lord, in Lord of the Rings where a ring was to be destroyed and a fellowship took that task. In the A Song of Ice and Fire, there is no single quest but many small and simultaneous quests by many clans and individuals. This concept of the quest can be extended to mythologies as Joseph Campbell writes in The Hero with a Thousand Faces, that all mythological characters in almost all religions have similar stories and a hero has to leave his home and gain something to return as a hero. In The Hobbit, there are many types of characters, all having their unique characteristics. 'Men' are most similar to what we are. 'Dwarves' are obviously short and males have long beards. They are fine craftsmen. 'Elves' are immortal and fine archers. Then there were 'Hobbits', one of whom was one of the central characters of this novel. They were flat-footed and lived peacefully in the Shire. Wizards came with all sorts of trickery. Having so many characters is a part of the fantasy genre and many stories are combined in this way with which people can relate to. Also, since such imaginary characters are not found in nature, so it increases the curiosity of people. Related to imaginary characters is the inclusion of characters and folklore around the world. The fight between two stone giants can be said to be such an incident. Also, a dragon, the favorite creature of all fantasies, is seen in this novel. Compared to other dragons such as one in A Song of Ice and Fire, the dragon in The Hobbit was very talkative. Normally we do not see dragons in stories which talk so much. At many places, we see poems recited by the characters. Culturally, these can be said to be similar to what can be seen in a country-life of the western world. The Hobbit created its own universe. A detailed map of Middle Earth where the events of the novel took place, came along with the novel. The Lord of the Rings became a huge success. The Silmarillion provided more details about the characters and many background stories. Tolkien even developed a language to be used by characters in the novel. This novel is recommended if you have not watched the movie yet.